Welcome back to grilledshane.com. Please, pull up a chair and stay awhile. 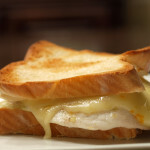 It has been awhile but I am glad to be back creating and cooking grilled cheese sandwiches. This spring/summer has brought new adventures and renewed optimism in pursuing my culinary dreams. Changes are a constant but I hope they are for the better. Way back when, on May 19, 2011, I received an email from Tillamook’s PR firm inviting me to A Tasty Tillamook Cheese Media Event with Chef Heidi Gibson. When I first read the subject, I thought it was simply a mass email and thought nothing of the sort. However, once I delved into the actual body, I realized that Tillamook had just personally invited ME to a grilled cheese specific event in San Francisco, California. I was very flattered. And then I began to truly think about attending said event. 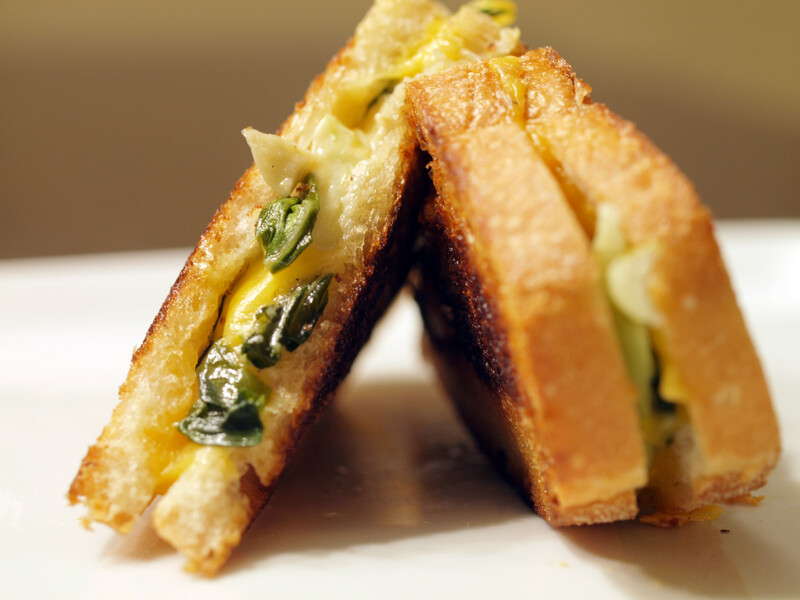 I mean, I have never been to San Fran and would love to one day go to The American Grilled Cheese Kitchen but would it be worth the quick trip? 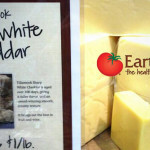 Prior to talking about this particular cheddar, I wanted to discuss Tillamook’s history/story, but their web site goes into so much depth and detail that trying to write just a couple of sentences would be futile. In other words, go read about Tillamook. Now. 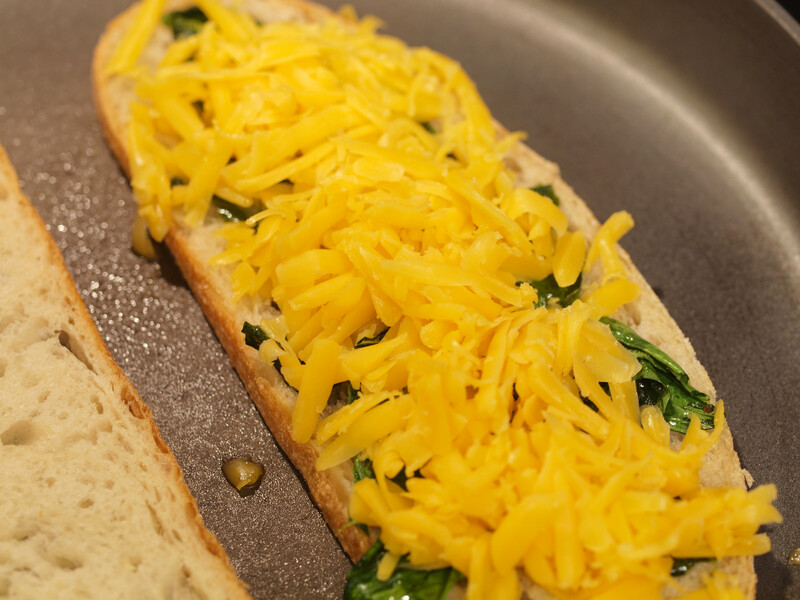 It has only been 24 hours since I cooked this grilled cheese and I have already made another grilled cheese as well as a gourmet mini-flatbread pizza using this particular cheddar. If that isn’t enough proof that I like this cheese, the fact that I continually munch on it as I shred it, should be. I typically prefer sharp cheddar, but this all natural medium cheddar, that has been aged over 60 days, is creamy/soft with a perfect hint of sharpness. I still have about 2/3 of the “baby loaf” and will make sure to enjoy it over the next few days and weeks. This week, the cheese was the easy part. 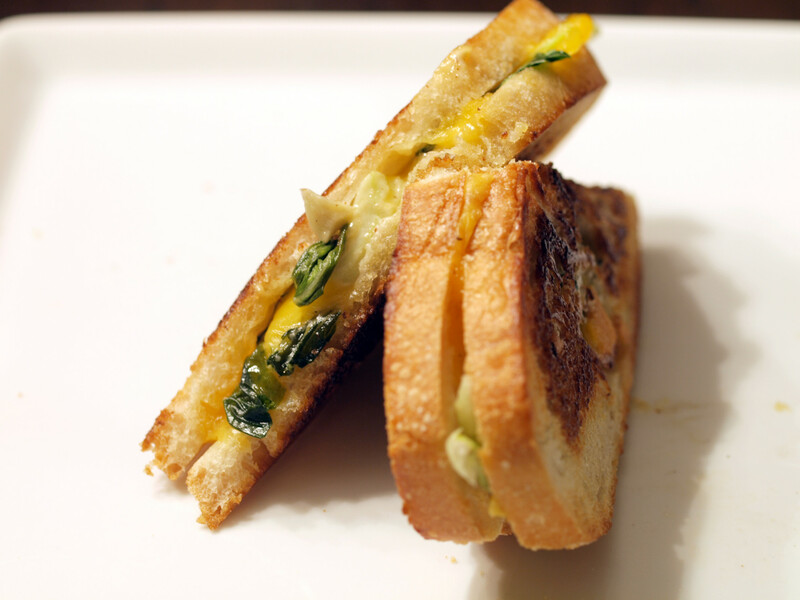 Choosing the additional ingredients for the grilled cheese was the difficult part. 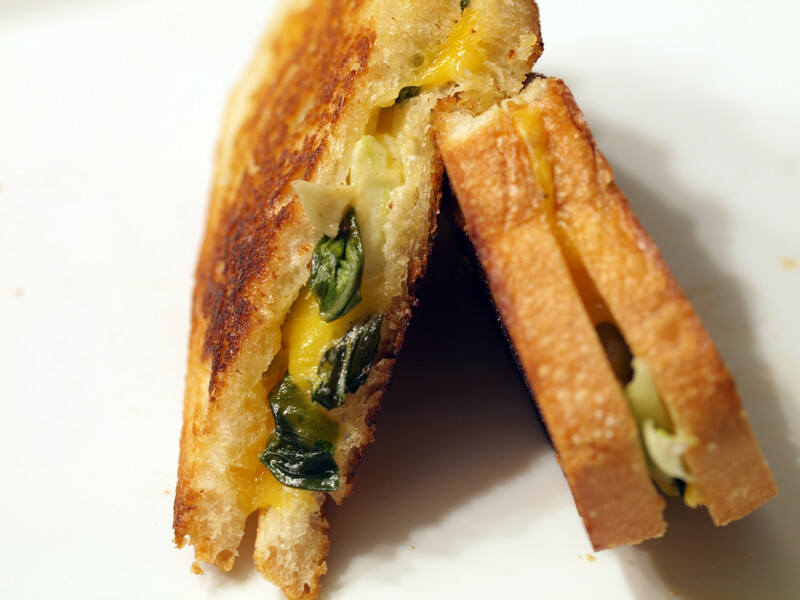 One night, at some point in my sleeping cycle, I thought, “Why not include some sort of green in this grilled cheese?” Not a bad idea since I have rarely used any greens. It was time to head to Whole Foods to see what they had. Somehow the sous chef and I narrowed it down, randomly, to watercress, baby bok choy and butter lettuce. Don’t ask how we ended up on those three items, we just kind of did. Anyway, when asking the lady Whole Foods worker about the different products, without any hesitation, she asked if we wanted to try all 3 of the greens. Little did we know that she would be sampling with us. The watercress was bitter and peppery with a similar flavor to horseradish. 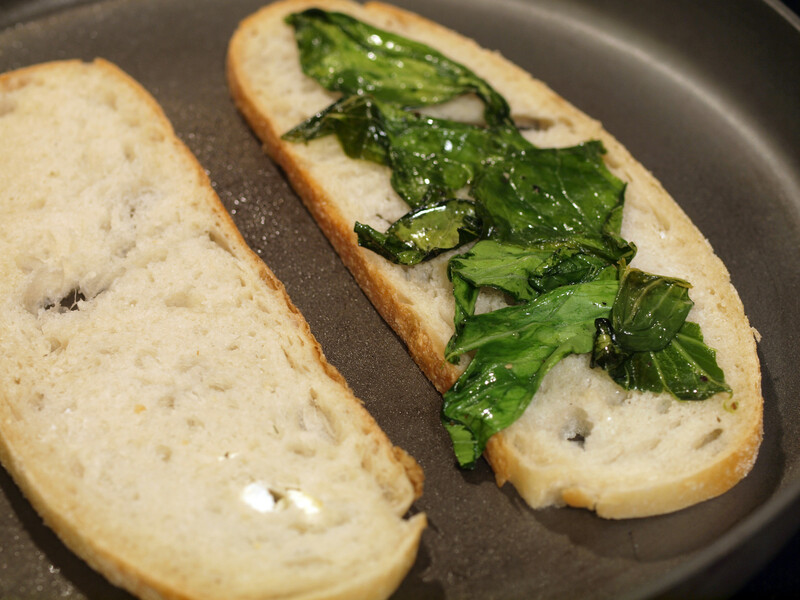 The butter lettuce was pretty simple and plain. The baby bok choy had a great crunch with an unexpected sweet flavor. We had our winner: baby bok choy. I knew very little about baby bok choy other than we use it in our Asian vegetable mixture at work and that it is crunchy. When I have tried it in the past, the taste was very mild while the texture was the true focus. However, with this baby bok choy, the crunch and the sweet flavor were the focus. Bok choy, or brassica chinensis to use its scientific name, is classified as a cabbage. Nonetheless, bok choy bears little resemblance to the round European cabbages found in western supermarkets, or to Napa Cabbage for that matter. Its white stalks resemble celery without the stringiness, while the dark green, crinkly leaves of the most common variety is similar to Romaine lettuce. The Chinese commonly refer to bok choy as pak choi or “white vegetable.” Another common name is white cabbage. I didn’t want to cook the stem portion of the baby bok choy, electing to keep it raw, but the leaf portion provided an interesting conundrum: use or discard? 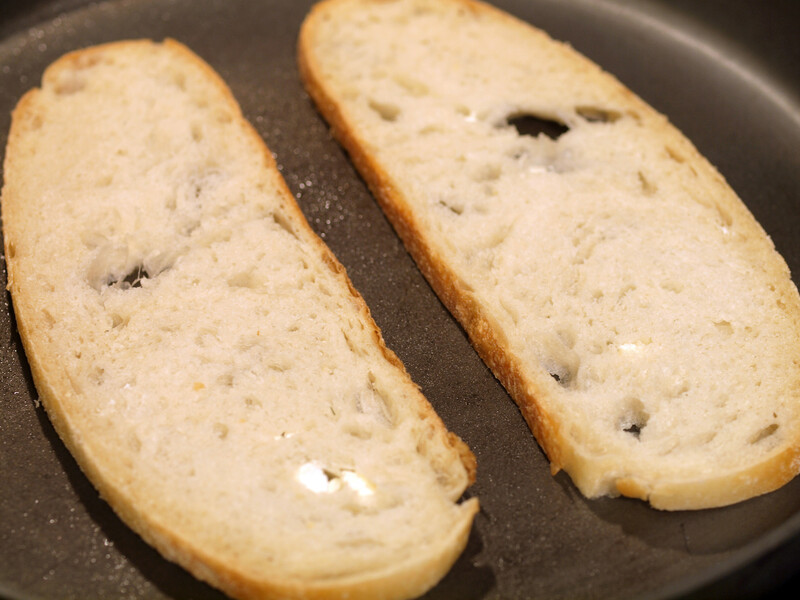 I decided to use it and sauté it a bit in olive oil, salt and pepper. 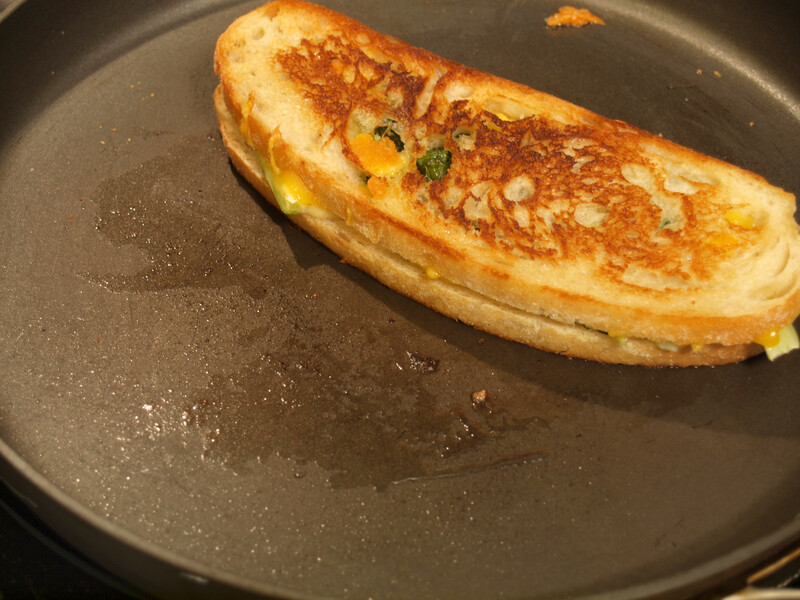 It only took a couple minutes to wilt and by that time, it was ready to be added to the grilled cheese. Unfortunately, I did not take any specific pictures of the homemade mustard aioli, but I believe it to be the winning ingredient in this sandwich. For Father’s Day, after making some homemade hamburgers for dinner and putting them on the grill, I decided I wanted to make some aioli to go on top. Somehow I stumbled on mustard aioli. 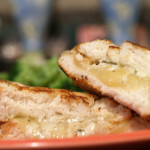 Once I tasted the sauce on the hamburgers, I knew it would be perfect for a grilled cheese such as this. Included in the aioli is mayonnaise, garlic, lemon juice, salt, pepper and Cowboy By Choice Rodeo Kick mustard (a local brand). 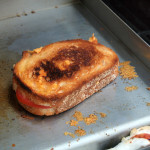 Now what bread would be perfect for this grilled cheese? I went with tuscan white, courtesy of Whole Foods. It was a good, crunchy choice. 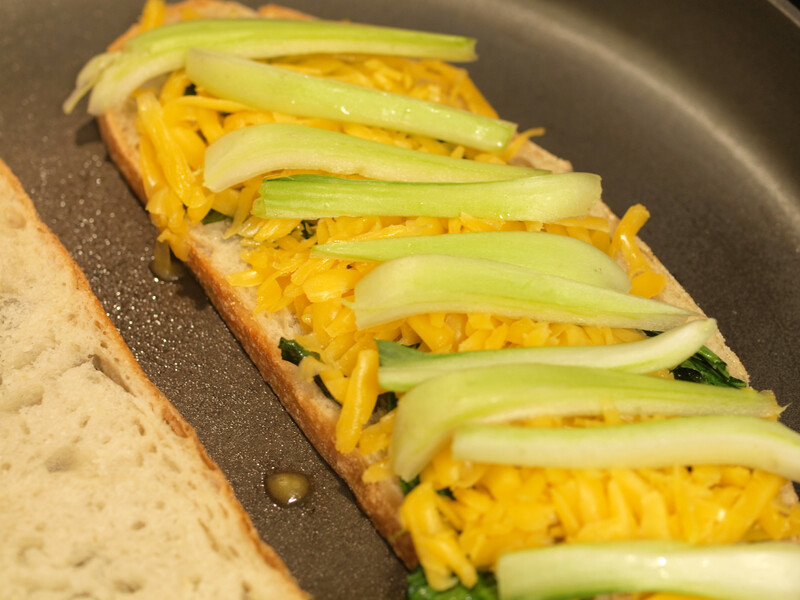 Thanks to some free Tillamook Mild Cheddar cheese, I was able to create a great grilled cheese sandwich and cook and enjoy for the first time, baby bok choy. Add in a homemade mustard aioli and you have yourself a winning sandwich. 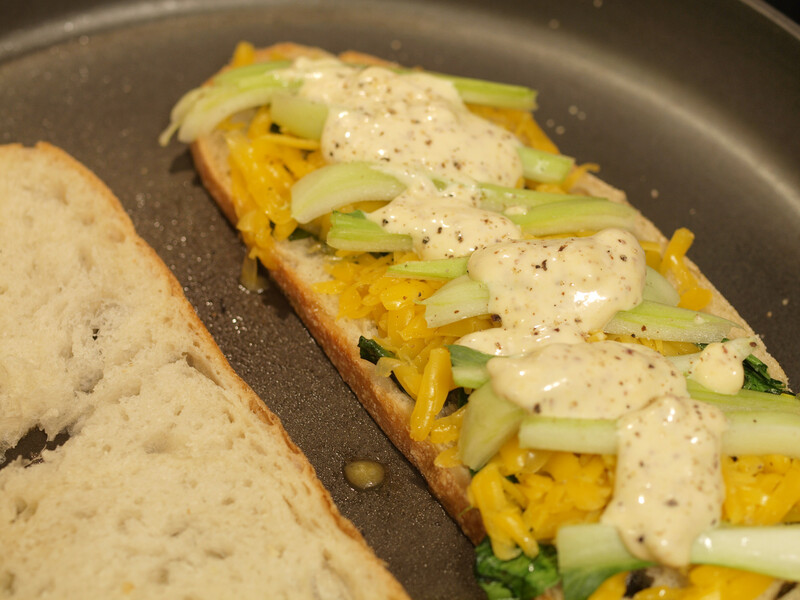 The crunch of the bread/bok choy plus the creaminess of the aioli created a great contrast in textures. 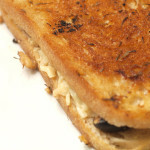 Honestly, there isn’t much to say about this grilled cheese except that it was delicious. 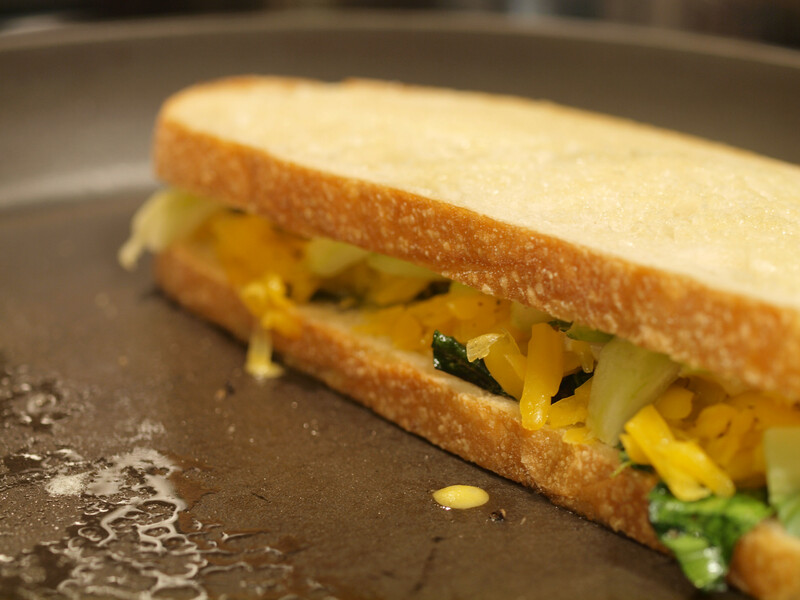 Posted in Grilled Cheese and tagged A, aioli, baby bok choy, bok choy, cheddar, grilled, medium cheddar, mustard aioli, tillamook, tuscan white.